This week we had a letter home from the school, it looked like any other letter the schools sends home to us, this one was entitled ‘Scottish Standardised National Assessments (SSNA)’. Unusually I read the letter immediately, rather than relegating it to the ever-growing pile. It was the usual stuff around updating us on the developing assessment system for school children in Scotland and then, to my surprise, came a very significant announcement thrown in at the end. Our children’s school was lifting their ban on girls wearing trousers. The school which has stoically held out against the march of progress and female sartorial emancipation was, at last, changing its policy. I actually felt rather emotional. When my younger daughter, who hasn’t worn a skirt or dress since she was old enough to say ‘no’, was about a year away from moving up to secondary school I had a conversation with her. I had heard that other parents and pupils had failed in requests to wear trousers and I was worried. There would be no chance at all that Natalie would be able to wear a skirt – the most upset I had ever seen her was when someone was trying to get her to wear a skirt or a dress, when her identity as a shorts wearing, football playing, wear-a-tie-on-a-smart-occasion, sport-loving girl is squeezed into someone else’s idea of what her identity should be. I explained that there were two options for us: we could start our own campaign and get the school to change; or we could send her to another school where she would be able to wear trousers. I have to admit I was kind of relishing a bit of a fight, a chance to deliver a small blow for justice and equality. Having delivered many a campaign through work and in my spare time I already had the campaign strategy worked out in my head and it even had a name “Operation Girls Wear the Trousers”. But it would be hard work, could take a while and would mean that Natalie would be in the spotlight and would need to be a full partner in the project. She was all for taking on the school – ‘let’s change it’ she said, and I did a little dance. It seemed to me that this should be a relatively easy campaign to win. I looked up other cases of parental challenges to schools that refused girls to wear trousers (and those where boys had campaigned to wear skirts) and they all had something in common, if they went as far as lawyers getting involved, in every case the school had backed down before it reached court on legal advice that the case was unwinnable. This meant that there was no case law on the subject, however I read clear guidance from the Scottish Government to schools that there should not be gender specific uniform policy, and (utterly ignorant on matters of law) surmised that, if Natalie showed up at school in trousers and the school sent her home, thus denying her an education, they could be breaking the law in the form of the Equalities Act 2010 (Scotland) and I could justifiably call the police. However this was the stuff that would be rolled out if all else failed, the final stages of our campaign. At the moment we needed to get everything else in line – first a direct appeal to the school and then, if that failed, drawing local councillors, MSPs and the media into the campaign. Natalie did some ground work and wrote to all the councillors standing in the local election and asked their views on girls being allowed to wear trousers to school. She had a great response and offers of help with her campaign. Then we heard back from the school, they would meet with me and Natalie to discuss the issue. We showed up to the school office at the allotted time, Natalie very smart in her primary school uniform: dark shorts (she always wore shorts then), smart shirt and a tie, short back and sides. The Deputy Head invited me in, for now Natalie would wait in the office. After the starting pleasantries and explaination that Natalie would never, could never, wear a skirt he said thoughtfully, “So….Would you say that this is a gender issue?” (pronouncing ‘gender issue’ in the same, half whisper that Miranda would use when saying ‘sexual’). “Well Natalie is very happy, she plays football, she wears trousers, climbs trees, hangs out with boys, she’s happy being herself. You could say she’s a tomboy”. “Well in that case school policy clearly states that she will need to wear a skirt” was the reply. I was a little floored at this so tried to clarify that Natalie absolutely wouldn’t wear a skirt, it just wasn’t a possibility. She couldn’t bring herself to, it just wasn’t, well …it just wasn’t her. But the policy was immovable. She would just have to wear a skirt if she was attending the school. “So you are saying to me that I need to tell Natalie that she’ll just have to wear a skirt, no discussions, unless she wants to be a boy. In which case she can wear trousers?” I said. “Do you really think that telling my happy, well-balanced eleven year old that she will have to become a boy if she wants to keep on wearing trousers is in her best interests?” I asked, getting perhaps a little shrill as I thought through how that conversation would go. How ludicrous, I thought, that we cannot allow the possibility of a trouser-wearing girl; that someone who wears trousers must actually secretly want to be a boy. We are in the world of 2017 where some of the world’s most powerful people are girls in trousers: Hilary Clinton, Angela Merkle. For crying out loud I wear trousers all the time, half the female teachers at the school wear trousers and I am supposed to go home and talk to my daughter about whether she actually wants to be a boy. Even Enid Blyton, hardly the most feminist of authors had a tomboy character in the Famous Five books, the short-haired, shorts and sensible shoe-wearing George. “Well, when you put it like that” said the Deputy Head “I suppose it does sound a bit strange.” We brought Natalie in and chatted about her ambitions and plans. She was determined to attend the school she explained because it had such a good reputation and she wanted to be an engineer, or an accountant or perhaps an architect. She chatted a bit about football and why she always wears trousers or shorts ‘just because that’s what I wear’ she said. We went home, Natalie having had a good meeting, me having had an extremely draining and stressful one, and awaited the verdict. It arrived in a week, bearing news that yes Natalie would be able to wear trousers at school. What a relief. But also a disappointment that it was the end of our campaign. We had won the battle for Natalie to wear trousers, but we hadn’t won the war and I thought of all the people that would come after us having to have that awkward, strange and potentially damaging meeting. However now we had nothing to fight against. I assured Natalie that if she wanted to campaign when she got to the school I would roll out Operation Girls Wear the Trousers with glee, but until that moment, the campaign plan would be mothballed. I was still waiting for that opportunity when the letter came through. First I was really happy; I cried a little; I was filled with relief for all the girls and their families that would come after us that wouldn’t have to go to ‘that meeting’*. And then I laughed and laughed when I read those three paragraphs again, slipped in nonchalantly at the end of a letter about something completely different. To announce the news that they were belatedly entering the 20th century, they had chosen to use archaically 19th century language. ‘Some may see trousers as modest, comfortable and practical’. Eh?!!? Do all the others think trousers on women are shockingly provocative? Like women riding astride a horse rather than side saddle, or going out without a chaperone? Finally, there’s that extraordinary last paragraph where they seem to suggest that allowing girls to wear trousers could be a slippery slope to boys demanding to wear skirts, as if women wearing trousers is some new experiment and hasn’t been common in society for considerably more than 70 years. And all this in a country where a skirt is the national dress for men. I simply give up…. However I feel Natalie and I won’t be able to hang up our campaigning sensible shoes just yet. As Natalie’s 15 year old sister gleefully reminds her on a regular basis, next year, while the boys are timetabled basket ball coaching, the girls will do cheerleading. It goes without saying that this is anathema to Natalie… I can’t help feeling that compulsory cheerleading for girls may be the next bastion of sexism in the school to fall. names have been changed to protect the innocent…. *I have, since, discovered another family from the school who had ‘that meeting’ and, judging by their description, it had a similar content to ours. 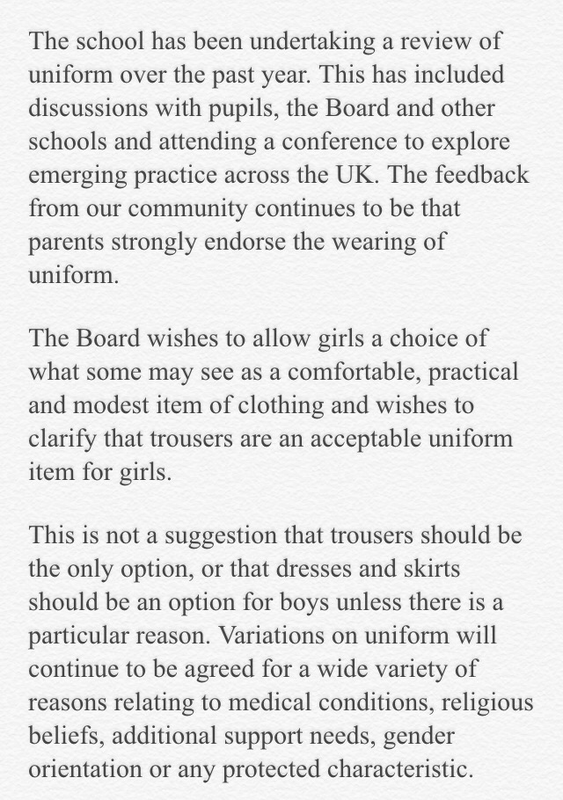 I know many, many pupils and parents from the school have campaigned for the right to wear trousers over many years. Please feel free to add your own experiences to the comments section. This evening I read that Sainsbury’s supermarket are moving towards creating their own standards and away from the Fairtrade mark. The pilot is with tea and the Fairtrade Association is concerns that it waters down the principles of Fairtrade, especially in community empowerment where, instead of communities receiving the Fairtrafe premium direct to decide how to spend it, the premium will be retained by Sainsbury’s foundation and spent by them on projects. There is a petition to sign here. But from my own personal experience. There is nothing that gets things done more effectively than a barrage of emails and letters to senior figures. So I have written emails to the CEO Mike.coupe@sainsburys.co.uk and the Chair david.tyler@sainsburys.co.uk. Here is the letter and below the response from the CEO and my reply to him. I am a very long-time and loyal customer of Sainbury’s supermarket. Although I try to shop in local shops as much as I can I have been going to the XXXX, Glasgow store for my supermarket shopping since I moved to the area as a student 17 years ago. I like that Sainbury’s was one of the first supermarkets to stock Fairtrade and I always choose Fairtrade tea, coffee, bananas, sugar and other items like Fairtrade wine from time to time, also buying it from our church Fairtrade stall. As someone with an interest in how we, as consumers, can have the most positive effect on the world- through trade with developing nations and also minimizing impacts on the environment – I am aware of the huge positive effect that Fairtrade has had on the livelihoods of small farmers and communities in the developing world. I don’t think it is exaggerating to say that I was absolutely horrified to read that Sainsbury’s will be abandoning the Fairtrade mark for your own standards. This decision betrays both an organisation that has steadfastly for decades worked to better the livelihoods of those creating products for consumption in the global north, and the farmers and cooperatives themselves. I am asking you, as CEO to reconsider this decision. Although it will be a huge deal for me, I have decided that if this decision is not reversed I will no longer be able to shop at Sainsbury’s. Many of my friends locally also shop in Sainbury’s and I will be talking to them about my concerns. Thanks for your email. I’m sorry you’re disappointed with our recent decision regarding our tea and I welcome the opportunity to address your concerns. As you’re aware, we’ve announced a new approach to sustainable sourcing that is aimed at helping our farmers and their communities meet the increasingly complex challenges of the 21st century and improve their quality of life, at the same time, securing the future of the UK’s most popular products. Please be assured our Fairly Traded tea pilot gives farmers all the benefits that they receive through Fairtrade, as well as some really important added extra commitments and support. Along with the same level of funding they will also have longer-term relationships and receive expert advice and practical support on the ground. This will help them build resilient and sustainable businesses for the future. By guaranteeing the minimum price for their tea crop, as well as a social premium for their investment along with building longer-term relationships, individually-tailored advice and practical support, the pilot of our Fairly Traded scheme aims to boost tea farmers’ resilience and ability to adapt to face these challenges. This will ensure a better quality of life for their workers and communities too. Sainsbury’s Sustainability Standards use existing standards like Fairtrade as their base, but add to this starting point incremental enhancements that fill the gaps in these existing schemes to ensure we and our suppliers, farmers and growers are addressing all of the important Ethical, Economic and Environmental issues. I would like to confirm we are the biggest Fairtrade retailer in the world and will continue to be so. Even without tea, this is a pilot project on one product. The purpose of our Fairly Traded Tea pilot is to build upon the Fairtrade model and, by using our wider experience, offer our tea farmers more to empower them to build resilient businesses and communities. We will be monitoring this project very closely and have no current plans to extend the pilot further. I’m grateful to you for taking the time to contact me, giving me the opportunity to explain our position. Thank you very much for your swift response. I have posted it on my blog alongside my original letter. In your letter you emphasise Sainsbury’s commitment to Fairtrade and, indeed, this is one of the reasons that Sainsbury’s has been my supermarket of choice for 17 years (foregoing the considerable benefits of a loyalty card in favour of shopper anonymity). However the letter doesn’t address the reasons for the change. The Fairtrade Foundation has expressed concern that the standards your supermarket are putting in place reserve the ‘premium’ to the Sainsbury’s Foundation to distribute rather than giving communities the decision making powers over the money they make. This goes against Fairtrade principles of community empowerment. When a supermarket sets its own Fairtrade standards and governance structures it also opens up the possibility that standards could be watered down further in future, for the sake of profits or from pressure from shareholders. The Fairtrade mark gives shoppers the confidence that an independent body, one that has shown longevity and commitment to the small farmer coops it supports, for decades, has audited the product. Your move undermines the Fairtrade movement as you are the biggest buyer of Fairtrade goods, and with tea presumably being just the start of your plans. I feel let down by a retailer who I considered to one of the more ethical food retailers. I cannot see how this will help either shoppers or yourselves as ditching such a well recognised brand as Fairtrade will confuse shoppers who are looking for high quality products that can also do some good in the world. It will also hugely damage your reputation in something that you justifiably have a unique selling point in – your support for Fairtrade and ethical principles. I urge you to reverse your decision and reinstate the Fairtrade mark for your tea and not to publicly rule out extending the scheme further . Thanks for your further email to Mike Coupe, I’ve been asked to reply on his behalf. The tea suppliers, farmers and growers who supply Sainsbury’s have welcomed our engagement and the discussions with them on this initiative and we are working closely with them as we build the pilot. I can only emphasise that those suppliers and farmers within Sainsbury’s supply chains, whether that’s our dairy farmers in the UK or the parts of tea sector in Africa and Asia that we are working with, have to be our focus, and doing what’s right for those farmers, their communities and our customers. We aim to bring far more benefits to them and their communities, this is a cost neutral programme for us – we are not making any savings. I understand your concern around the empowerment of these farmers, however there are a number of views on what empowerment means in reality. From our perspective the most empowered communities are those that are the best informed, connected and up to date, able to access the best information, and those that are supported to decide upon and produce the best investment plans. Empowerment comes from longer term commitments, and as a consequence the ability to make longer term investments, providing more certainty in what I becoming a more uncertain world. All of the social premium will be ring-fenced transparently for our producers and only available for them, for their investment plans, created and owned by our farmers. By working with experts on the ground and with the independent guidance of our Sainsbury’s Foundation Advisory Board, we will be further challenged to ensure our farmers and their communities have had the best support and that they build plans that will deliver sustainable and resilient communities and businesses. There are a plethora of certifications across hundreds of products in our stores and our Sustainability Standards will recognise and build on these as opposed to diluting the progress already in place, they have been co-authored and peer reviewed by our key suppliers, producers, industry experts and from more than 50 independent organisations and we have benchmarked in recognition for over 70 existing standards, frameworks and programmes. They ensure we are covering the full breadth of social, economic and environmental issues, further using data to support benchmarking, continuous improvement and the sharing of best practice. Participation in the Standards framework will also provide our suppliers, farmers and producers with cutting-edge information to help identify, measure and manage all aspects of their own unique businesses, and to ensure resilience in the face of escalating global challenges. These insights will enable farmers to develop strategic action plans to improve their business performance and the well-being of their workers and communities. Far from adding to any confusion, the new Sainsbury’s Sustainability Standards, across 35 of our key crops and ingredients, could make it even simpler and easier for our customers to understand. We will be supporting the introduction of our pilot with comprehensive information available for customers and as these products won’t carry the Fairtrade logo, (which has been stated as a well-recognised mark), are confident in ensuring our customers have all the information they need. Thank you for the time you’ve taken to further share your concerns. We have committed to sharing transparently the work as we move forward, we will ensure that we increase the level of transparency and disclosure around our investment activity and the progress we make, in the belief that we should be judged on our results.